As the social media world continues to grow and evolve, organizations are beginning to look at social media as more than just an inexpensive outlet for getting their marketing messages heard. As we move into the latter half of 2014, there are 7 trends beginning to take shape according to PR Daily and Media Mosaic. As you read through the trends, take note of the ones your organization does or does not participate in. Polls show that more brands are beginning to listen more actively to their consumers. 24% of marketers said they plan on using more effective listening techniques, a 2% increase from 2013. This offers brands an opportunity to interact on a more personal level with their consumers. The lure of social advertising is becoming increasingly enticing to social media marketers. 57% of marketers used social ads in 2013, and this is expected to increase by 23% in 2014. Social Ads give you the opportunity to reach the audience in which you’ve invested a lot of money and time into nurturing, which is why social media ad revenues are expected to grow by $11 billion by 2017. The use of images in social media marketing has grown exponentially over the years and is continuing to grow in 2014. Images allow marketers to share a lot of information in a short amount of time in space. Infographics are becoming an increasingly popular promotion tool for brands. Prior to the rise of social media, database marketing has been the conventional go-to solution to increase sales. With the seemingly boundless rise of social media however, companies are presented with an opportunity to reach customers immediately and efficiently. It gives marketers great insight into consumer culture through customer activity such as comments and likes on company products. 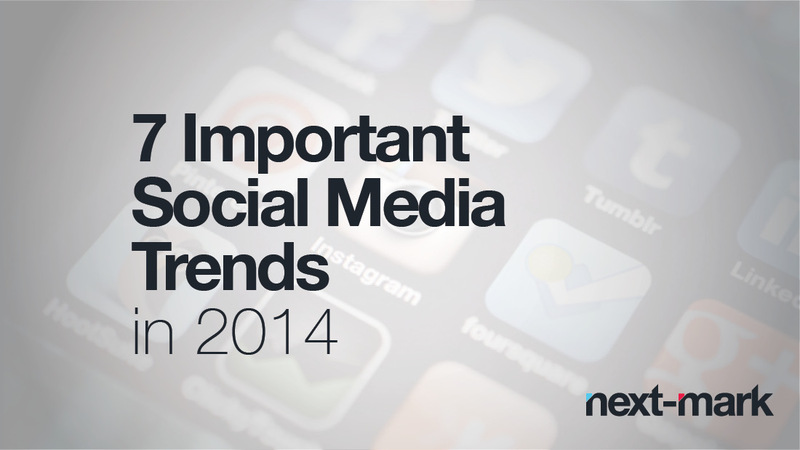 2014 will see the further integration of social media with the rest of the business. Polls found that 57% respondents have a dedicated social media team to strategize, and implement planned social media initiatives. However, most only have the budget to have a team of 3 or fewer. Information from social sites is being used more and more to effectively gage and monitor audiences. This will push brands to place much more emphasis on formulating increasingly creative campaigns. Despite the ongoing momentum for everything digital, organizations still have to find the best recipe for effective marketing tactics. This means finding ways to bring online content into the real world in order to engage consumers. Thus, in 2014 we are seeing companies take a much more hands on approach to finding that their consumers care about in order to find those winning practices. At Next-Mark we work with major brands in managing their social media content and strategy. Let us know if we can help. At Next-Mark, Austen’s emphasis is to develop and execute stellar public relations campaigns and generate dynamic content on various social media platforms. As if he isn’t busy enough, he also works with journalists and editors to secure top media placements for our clients.